Completion of the Third Plant at YASKAWA (CHINA) ROBOTICS CO., LTD.
Yaskawa Electric Corporation (head office: Kitakyushu, Fukuoka; Representative Director and President: Hiroshi Ogasawara) is pleased to announce that a completion ceremony was held on June 15, 2018 of the third plant at Yaskawa (China) robotics Co., Ltd. (No.59 Wujin West Avenue, Gaojin District, Wujin District, Changzhou City, Jiangsu, China). Automation in manufacturing sites advances at a rapid pace in China on the back of a shortage of workforce and surging manpower costs due to its declining birthrate and aging population. And in line with the continuous growth of China’s economy, demand for industrial robots is expanding in a wide range of areas beginning with smartphones, computers, household appliances, communication devices, and heavyweight transportation in addition to auto-related markets. 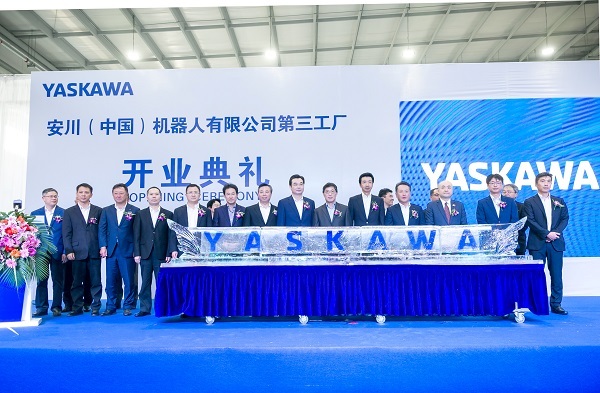 In order to respond to such demand, Yaskawa Electric (China) has built the third plant to add to its first and second plants to strengthen its capacity to manufacture products at the site where demand is incurred. The completion of the third plant and reorganization for the first and second plants will increase its manufacturing capacity from 1,000 units monthly to 1,500 units. Many guests including the deputy secretary of Changzhou city and the consul general of Japan in Shanghai attended the completion ceremony, and the company gave an overview of the new plant and the current status of its robotics business in China.